The Stand by Me Abdi Academy cares for 280 of Dembi Dollo’s most at risk children; giving them a fantastic education, renewed health, nutrition and love. Our care reaches the families of our children through our Keeping Families Together programme and HIV Food programme. This comprehensive care helps to ensure the well-being and health of our children and their family members, allowing them to stay living with their loving families while attending school. Lami is one such child gaining a quality education at our school. Lami’s mother remarried after her husband’s death and left Lami with his grandmother. Lami’s grandmother Yofete looks after him with care and affection, but sadly the two of them live in very poor conditions and it is difficult for Lami’s grandmother to find work so we help them with rent and food on the Keeping Families Together programme. Just like Lami’s Grandmother, many families desire to earn a living, work hard and provide for their children but they are just so poor that they cannot afford any resources to do so. For this reason we have enrolled 30 families onto our Income Generating Activity programme which provides small loans to families, financial or in the form of livestock, so they can start their own businesses and eventually become self-sufficient. Lami’s Grandmother, Yofete, is one of the 30 selected. Yofete received money three months ago and bought two pregnant sheep. One of the sheep bore two lambs four weeks ago and they are expecting another lamb in the near future from the other sheep. 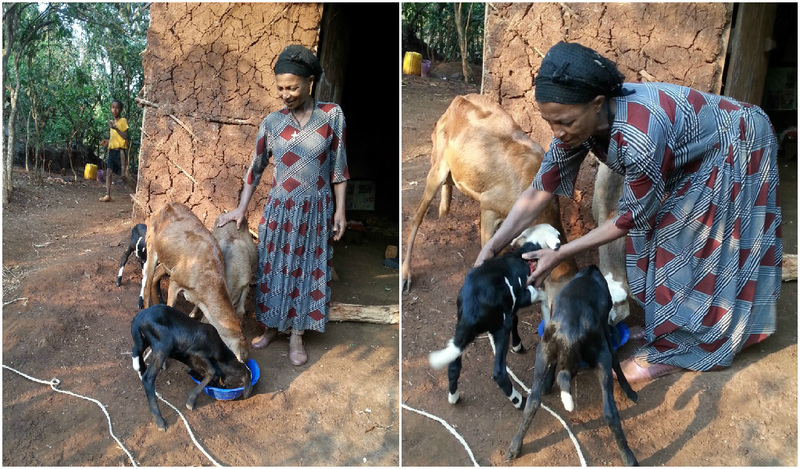 Livestock rearing in Dembi Dollo provides a good source of income which will bring huge improvement to Lami and his grandmother’s lives. The majority of parents on the Income Generating Activity programme are mothers or grandmothers of our children. Through engagement in mini-business, petty trade, rearing livestock and training from a micro enterprise bureau, the programme will help them become self-sufficient after 12 months. Like Yofete, Mums and Grannys do so much to keep our families together. Say “thank you” this Mother’s day by supporting one of our families on the Keeping Families Together programme for one month for £10. Call us on 01708 442271 to buy this gift and we will send you a card to share with your Mum or Granny.